What better place than a room full of developers—people accustomed to harnessing as much computing power as they can get their hands on—to unveil a brand new Mac Pro? And so that’s just what Apple did on Monday, devoting a large portion of the 2013 WWDC keynote to a product we’ve long been hoping for—and even predicting. It’s a new Mac Pro, not at all like the old Mac Pro, and it’s coming later this year. The new Mac Pro on display at WWDC 2013. I got a chance to get my hands on one, albeit briefly, on Monday afternoon. It’s a gorgeous piece of hardware, though it does somewhat resemble the wastebasket I have in my bedroom. The new Mac Pro is a black cylinder dense with high technology, from powerful Intel workstation-grade processors to two shockingly fast graphics cards to an array of expansion ports. When will the new Mac Pro models be available? Apple hasn’t announced a specific date when the new Mac Pro will ship. The company has stated only that the computer will be available “later this year.” We suspect that means sometime this fall, but it could be as late as Dec. 31. Apple similarly hasn’t announced prices for the new Mac Pro. Macworld editors have been taking wild guesses around the office, with estimates ranging from $2000 to $4000. (By way of comparison, the current Mac Pro costs $2499 for the 3.2GHz Quad-Core Intel Xeon-powered standard configuration and $3799 for the 12-core model with two 2.4GHz Xeon chips.) On the one hand, the new Mac Pro is roughly one eighth the volume of the current Mac Pro, and it uses fewer internal components, as well; on the other hand, Intel’s newest processor won’t be cheap, and the new Mac Pro uses pricey solid-state storage and two high-end video cards, even on the low end. What’s up with that design? Given that the current Mac Pro looks essentially the same as the 2003 Power Mac G5, any new design would stand out, but the new Mac Pro’s design is dramatically—nay, shockingly—different. 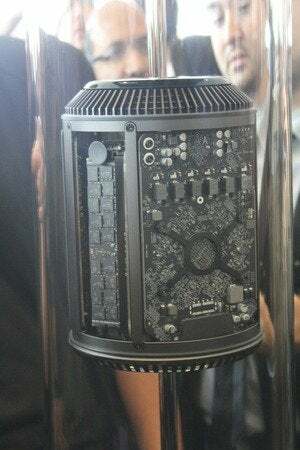 Instead of the traditional blocky “cheese grater” tower, the 2013 Mac Pro takes the shape of a black cylinder made of polished aluminum. 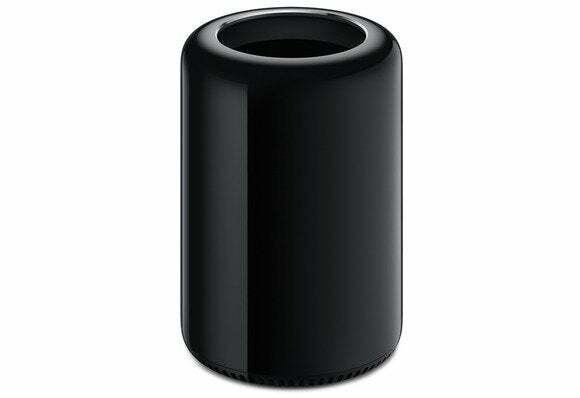 It’s a dense, heavy object, but much smaller than the old Mac Pro: just 9.9 inches tall and 6.6 inches in diameter. You can actually pick it up—and we did—with one hand by grabbing it by the top. That’s because while the Mac Pro’s case ends at the top of the cylinder, the internal housing, made of the same aluminum material as the exterior, ends an inch or so below that with a ringed vent above a single fan. You can grab the top of the external housing anywhere around the ring and pick it right up. 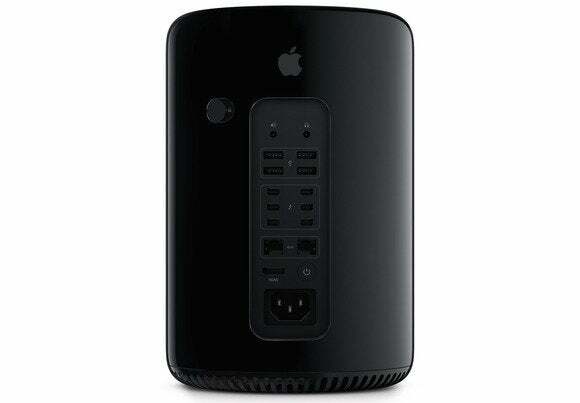 Apple also added some of its typical design flourishes to the new Mac Pro’s design. For example, if you turn the tower around to connect or disconnect a peripheral—more on that below—the computer automatically senses the movement and illuminates the back panel to make it easier to see the ports. Will the new Mac Pro be faster than current models? It would be difficult for the new ones to be slower than the current models, which (minor speed bumps aside) have been largely untouched for years. For starters, the 2013 Mac Pro will use Intel’s latest Xeon chipset, the Xeon E5. You’ll be able to configure the computer with up to 12 cores of processing power that, in Apple’s words, provide up to 40 GBps of “PCI Express gen 3 bandwidth and 256-bit-wide floating-point instructions.” The company claims the new Mac Pro’s processors will be up to twice as fast as the current model’s. 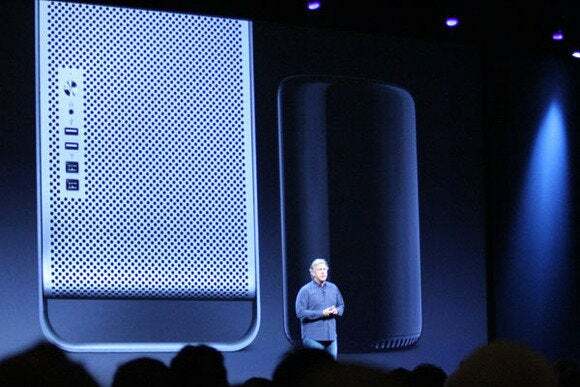 Apple’s Phil Schiller stacks the old Mac Pro (left) up against the new model during the WWDC 2013 keynote. The 2013 Mac Pro will also have significantly faster memory thanks to a four-channel DDR3 memory controller running at 1866MHz. The computer will use ECC (error-correcting code) memory and will offer up to 60 GBps of memory bandwidth (compared to 30 GBps for the current Mac Pro models). Also getting a big boost is the Mac Pro’s graphics capability. Unlike the current tower, the new model comes stock with two GPUs, each an AMD FirePro workstation GPU with up to 6GB of dedicated VRAM. Apple says those two GPUs offer up to 7 teraflops of performance—compared to 2.7 teraflops for the current Mac Pro—and can drive not one, not two, but three 4K-resolution (3840- by 2160-pixel) displays. Of course, the new Mac Pro also—finally—gets faster connectivity, as well, sporting six Thunderbolt 2 ports (which are up to twice as fast as the first-generation Thunderbolt ports on the rest of Apple’s current computers) and four USB 3.0 ports, compared to four FireWire 800 and five USB 2.0 ports on the current Mac Pro. How upgradeable is the new Mac Pro? The new Mac Pro’s RAM is situated in four memory slots and can be upgraded easily—you just slide off the computer’s cylindrical, metal sleeve, pop out the old memory, and insert new DIMMs. Apple's tech info about OS X Mavericks (PDF link) notes that OS X 10.9—which the new Mac Pro will presumably ship with—supports up to 128GB of RAM. The computer’s flash storage is also upgradeable, as it sits on a small card that connects to a socket on the motherboard (or in this case, it appears, a socket on one of the GPU boards). This means you can pop out that card and replace it with a new one. Before the new Mac Pro was announced, one of the frequent comments we heard was that professional-level users want upgradeable video cards. We can’t say anything definitively based on the limited information Apple has provided, but Apple’s website sure makes it look as though those dual GPUs are permanent residents—it doesn’t appear that you’ll be able to swap them out for more-powerful versions down the road. What about expandability? Will I be able to use my old expansion cards? Apple calls the new Mac Pro the “most expandable Mac yet.” Many people might dispute that contention, considering that the current Mac Pro offers four PCI Express slots, four internal hard-drive bays, and two optical-drive bays, while the 2013 Mac Pro will offer…well, none of those things. Apple bases its claim on the fact that with six Thunderbolt 2 ports, on three independent buses, you can connect up to 36 high-performance peripherals—each port supports six daisy-chained devices. Apple also says Thunderbolt 2 provides twice the throughput of the original Thunderbolt spec—up to 20 gbps to each connected device (and up to 25 times faster than FireWire 800). The company points out that those who need PCI Express slots can add a Thunderbolt PCI-expansion chassis. Those Thunderbolt ports also support Thunderbolt and Mini DisplayPort displays, and you also get an HDMI 1.4 port for connecting an HDMI display. Is there anything else notable about the new Mac Pro? 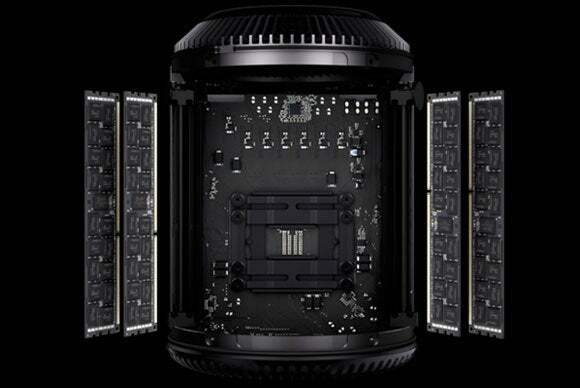 On the non-technical side, this Mac Pro is going to be assembled entirely in the United States, marking Apple’s return to American computer manufacturing. Apple’s website refers to “Texas, Florida, Illinois, Kentucky, and over a dozen other states across America” that have contributed to a product that was, of course, designed in California. Updated 8:30am with info about maximum RAM. Updated 12:30pm to correct comments about Thunderbolt 2's speed. Updated 6/12/2013 to clarify location of solid-state storage connector.